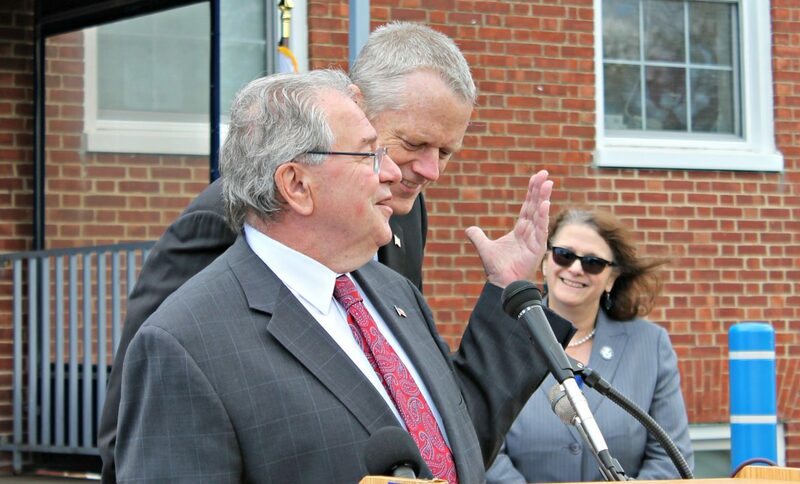 On Beacon Hill: Chasing unicorns from Boston to D.C.
Baker and DeLeo might have some talking to do once the sales tax holiday standoff blows over. The stage was set this week for what could be an awkward two weeks as senators prepare for their annual budgeting exercise knowing whatever they approve appears unlikely to stand up to the stress test it will go through in negotiations with the House later this spring. But even the state’s latest mini budget crisis couldn’t compete for oxygen with the conflagration that engulfed the nation’s capital and had tongues wagging 450 miles north, up the I-95 corridor, after President Donald Trump swung the ax that landed on FBI Director James Comey. Comey’s firing led to breathless questioning and speculating about the president’s motives, conflicting accounts from the White House of how and why it happened, and a made-for-SNL moment starring Sean Spicer emerging from some shrubbery ordering camera lights killed before he would take any questions. Gov. Charlie Baker said he was “shocked” by the Comey firing, and joined with the state’s all-Democratic Congressional delegation and Attorney General Maura Healey in calling for the FBI’s investigation into Trump campaign ties with Russia to be transferred to an independent authority. “Can you believe what’s happening?” a flabbergasted state Sen. Linda Forry asked a reporter. While cable news flickered in the background last week, Beacon Hill’s top three elected leaders got it started by commiserating in House Speaker Robert DeLeo’s office over the state of the state’s financial affairs. 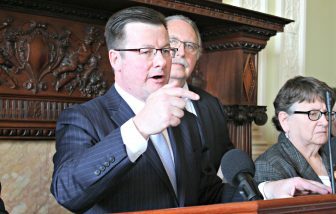 “There were no answers today other than, I think, a shared commitment to find the right way forward,” Senate Minority Leader Bruce Tarr said after the meeting of minds resulted in a number of theories being batted around as to why, in a period of economic growth, the state seems to lurch from budget crisis to budget crisis. Baker said he’s working through a solution to the $462 million shortfall in revenues, hoping against hope that May tax collections will alleviate some of the pressure on this year’s state budget. 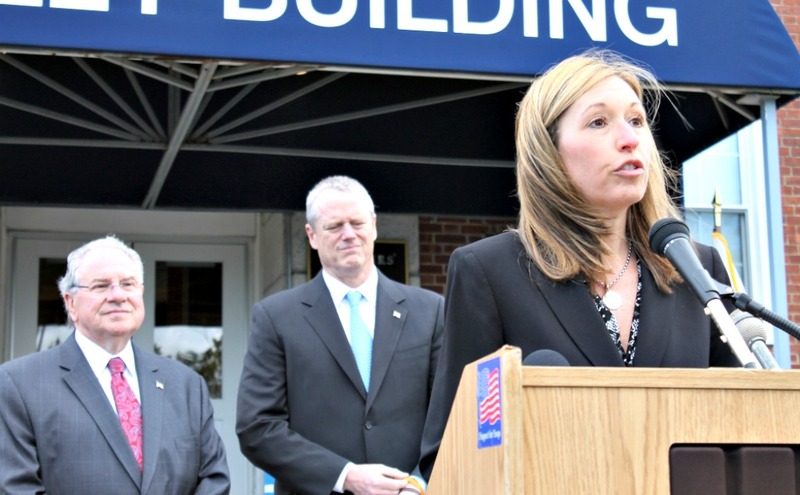 CHELSEA — The state’s $2.26 billion fiscal 2018 capital plan focuses on maintaining and modernizing government assets and will lead to more than $4 billion in investments beginning July 1, Gov. Charlie Baker said. The plan includes $59.4 million for a new court facility in Lowell, $4.5 million for the state archives building in Dorchester, and $38.7 million for a number of projects, including Senate Chamber renovations, at the State House. MassWorks, which uses infrastructure grants to spur economic development projects, receives $80 million in the plan, and the Massachusetts Life Sciences Center capital program is funded at $56 million. The plan puts $80 million toward the infrastructure program known as I-Cubed. Standing in front of a brick hospital for veterans built in 1949 late last week, Baker said the plan includes a roughly $8 million downpayment on a $199 million long-term care project at the Chelsea Soldiers Home, which he recalled visiting many times during his years in government dating back to the 1990s. Administration officials said they expect the new hospital building to be completed in 2020. Baker said the overall plan boosts capital spending by $70 million over the fiscal 2017 plan, and will lead to more than $4 billion in investments when paired with federal, local and private funding sources. Last year’s $2.19 billion capital plan was $65 million more than Baker’s first capital plan. The plan earmarks $85 million for capital expenses on about 50,000 public housing units around the state. In the information technology area, the plan identifies $131.2 million for projects whose total costs reach $277 million. Plans to improve the Chelsea Soldiers Home were warmly received on the chilly May afternoon. Olivia Anne Walsh, a 65-year-old Soldiers Home resident who was a U.S. Air Force ironworker in the Vietnam War, said staff and patients are “very excited” about progress on a replacement for the nearly 70-year-old hospital. “It was state of the art then. But years have gone by,” said Walsh, who said people have been talking about a new hospital for “many, many years” and the upgrade would afford patients better privacy, among other improvements. With the Senate prepared to release its budget plan Tuesday and commence debate a week later, Senate President Stanley Rosenberg said it’s full steam ahead, and any adjustments that need to be made can be made later in conference committee negotiations with the House. House Ways and Means Chairman Brian Dempsey confirmed it’s “likely” that will happen. House Ways and Means Chairman Brian Dempsey. Whether Senate leaders will propose new taxes in their budget to offset the slow revenue growth, consider tax changes through amendment or forego what would surely become a two-against-one fight with DeLeo and Baker is fueling some of the intrigue ahead of the budget release. Baker said a proposed tax on sugary drinks — a modified version of former Gov. Deval Patrick’s perennially rejected candy and soda sales tax — is a non-starter in his eyes with two strikes against it, one being that it’s a tax of any kind and secondly, it hits poorer families harder than others. The House gathered to consider the first significant, discretionary bill — apart from controversial pay raises for elected officials and judges — to be put before members this session: a bill of rights for pregnant workers. The branch unanimously supported the legislation that had been carefully crafted after its demise last session to win the backing of the business community, and Gov. Baker indicated that barring any major changes made by the Senate — that’s usually a good possibility — he would sign it. The bill requires employers to make reasonable accommodations for pregnant workers, including paid or unpaid time off, a temporary transfer to less strenuous duties, more frequent breaks or modified work schedules. The measure should be a slam dunk in the Senate, and as long as the branches can iron out any differences Speaker DeLeo could cross off one of the few priorities he outlined at the start of the session. If an offshore wind industry is to succeed in Massachusetts, it will require both competition and cooperation among developers and among states, and investments in port infrastructure that can help drive down the cost of future projects, a panel of offshore wind experts agree. The Northeast Clean Energy Council and Foley Hoag brought together developers, industry representatives, and officials from Massachusetts and New York late last week to take stock of the industry and discuss how the Northeast can forge the way for the American offshore wind industry. Half the panelists were in Boston, with the other half in New York connected via video conference. With one wind farm already up and running — Deepwater Wind’s 30-megawatt project off Block Island, Rhode Island became the nation’s first offshore wind farm last year — the panelists agreed that offshore energy production is approaching a tipping point at which more projects will begin to happen more quickly and, they predict, at lower costs. An August 2016 Massachusetts law calls for the procurement of up to 1,600 megawatts of offshore wind energy by 2027. A week before Gov. Charlie Baker signed that law, New York’s Public Service Commission issued an order setting a clean energy standard and requiring that half of the state’s electricity come from renewable sources by 2030, and New York Gov. Andrew Cuomo has committed to 2,400 megawatts of offshore wind off the coast of New York by 2030. But the most significant piece that’s missing is local infrastructure that would allow developers to move turbine parts, get workers to and from wind farm sites, and more efficiently stage later phases of a project. Pike said his organization is planning a May 31 conference on supply chain development to “begin the matchmaking process” between offshore wind developers and companies that want to become part of their supply chain. Noting that “this is more in the hands of state policymakers,” Clint Plummer, vice president of Deepwater Wind, said that investments in port infrastructure and vessels would have “the most significant impact on the cost” of offshore wind developments. Though some of the panelists will be competing for business in Massachusetts and New York, they agreed that Massachusetts, and the Northeast, is primed to be “the North American version of Denmark,” as Pike put it. More than 40 percent of Denmark’s energy supply comes from wind power. In 2013 Deepwater Wind won the nation’s first competitive lease auction, for its 30-megawatt wind farm, and by the end of 2017 as much as 750-megawatts could be in play. According to the Executive Office of Energy and Environmental Affairs, 1,600 megawatts of offshore wind power generation — the amount called for in the 2016 law — could supply electricity to about 640,000 homes.